Discussion in 'Guitar Emporium Archive' started by operanonverba, Apr 19, 2016. I bought this new in 2012. Hung onto it for a while and sold it on here last year. 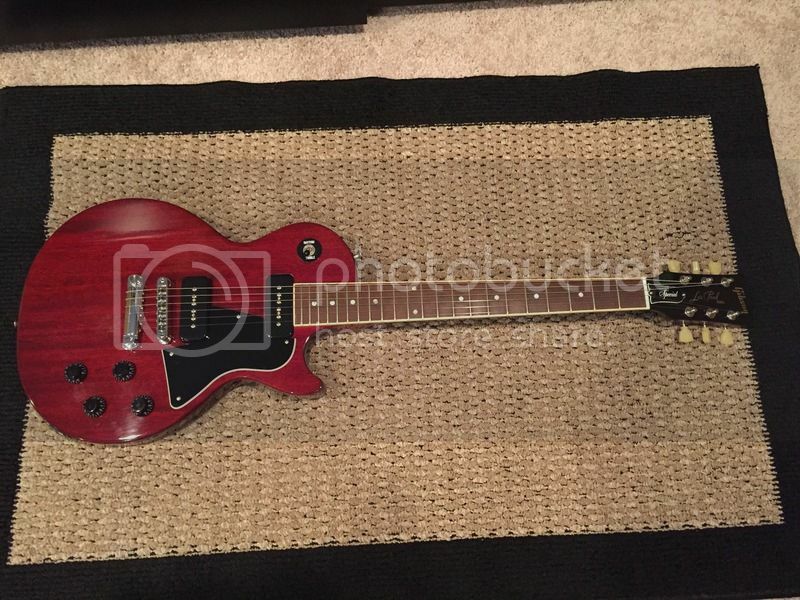 It recently came up for sale and I bought it back needing some P-90's in the lineup. 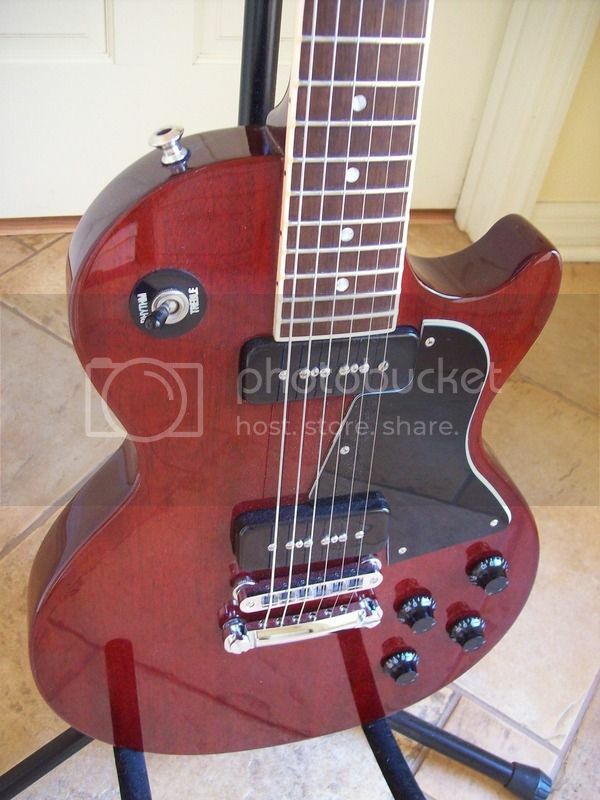 I love the older style ABR1 bridges and I just picked up a exact spec 92 off here in Cherry red so... she's up for grabs again. In great shape with just a few small impressions on the back. Nothing thru the finish. 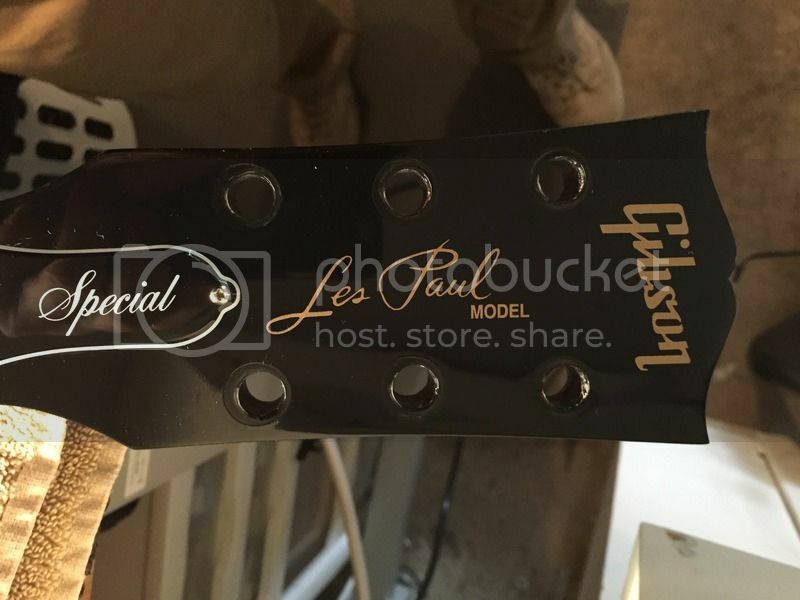 I had installed a set of Spertzel locking tuners on it over a month ago. This required me to drill out a small pilot hole for a pin on the tuner just below the factory top mount hole on the headstock. The tuner post holes were never touched as the Spertzels were a drop in other than the stabilizer pin. The pilot hole was of no concern to me as the stock tuners would cover it if I ever wanted to switch back. 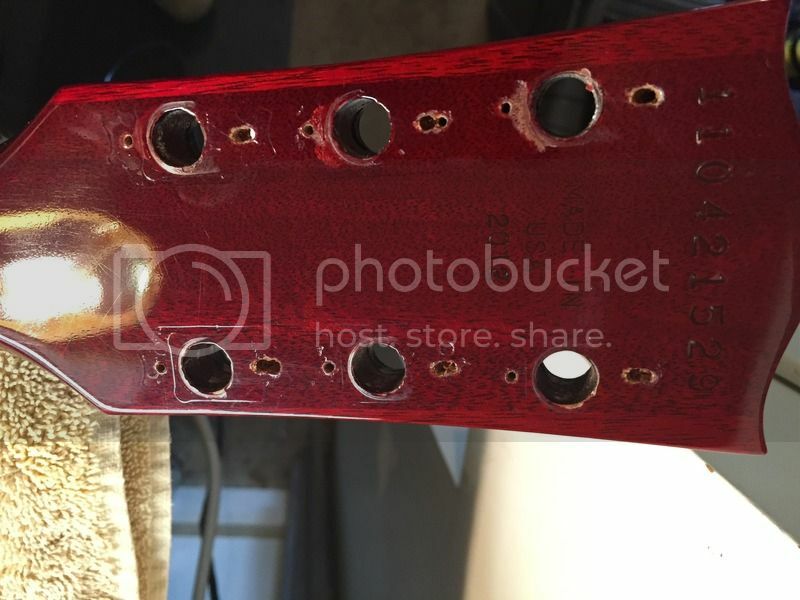 As I began to remove them and install the factory tuners I noticed that the pin had pushed away the small amount of wood between the factory drilled hole and the new drilled holes leaving small gaps. 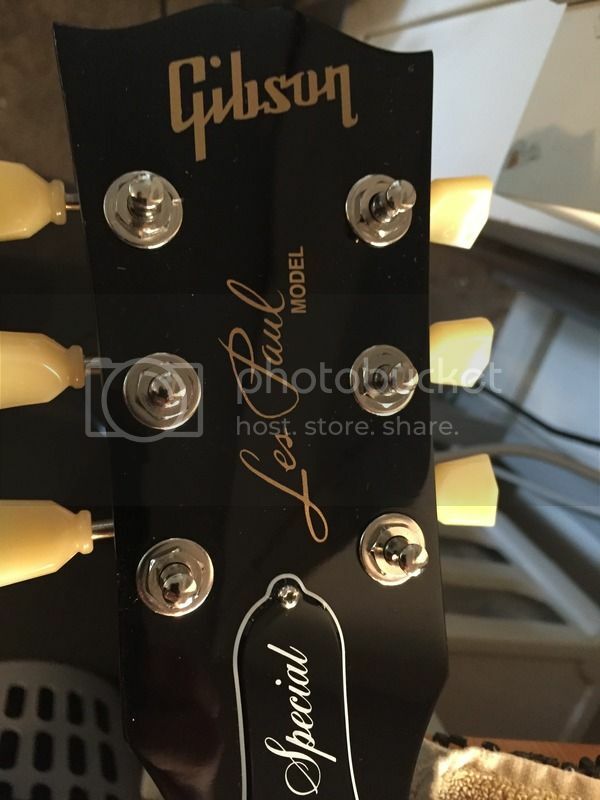 I believe this occurred while tightening the bolts on the headstock face and possibly while under string tension. Not sure. In several places the tuner body also left an impression on the nitro. All still covered by the stock tuners. I have installed the factory tuners back on but I used a slightly longer screw on the top mount hole to grab new wood. Nothing shows and there are no cracks or issues. Just want to disclose this detail. Below are photos showing what I'm talking about. With the discovered issue with the drilled wood under the tuners I'm discounting the price to reflect this. It is unstrung at this time and I only have 9's. I can leave it unstrung and send a set with it or string it if you want. This is a great guitar and the extra drilled tuner holes are really a non-issue. So here is a chance to grab a good one at a super price. $550 with a Gibson padded gig bag or $600 with a like new Ephiphone HSC shipped (Firm) PayPal gift or you pay the fees. Well this won't last long.